DO NOT PURCHASE UNTIL YOU HAVE CHECKED WITH YOUR AIRLINE FOR SIZE RESTRICTIONS AND HAVE MEASURED YOUR DOG. ONCE MEASURED, CONFIRMED THE DOG WILL FIT WITHIN THE INSIDE DIMENSIONS ACCORDING TO AIRLINE REQUIREMENTS. PLEASE REVIEW OUR RETURN POLICIES. RETURNS ARE SUBJECT TO A 50% RESTOCKING/RENTAL FEE. Ready to Assemble - Easy to assemble by hand - No Tools required. Put together or breaks down in minutes. 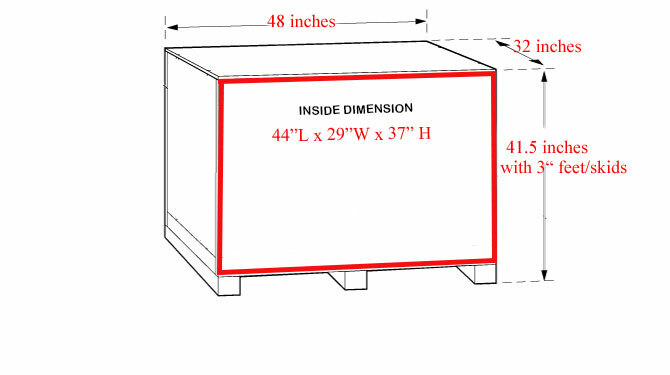 IATA Compliant - Reinforced crates Made of 100% plywood, approved for domestic or international air travel. Made in the USA -Custom made locally by expert wood-makers. Quality you can see and feel. Easy to Store - Breaks down and stacks together making it easy to store away for next use. Don’t sacrifice SAFETY & Security when transporting your dog. 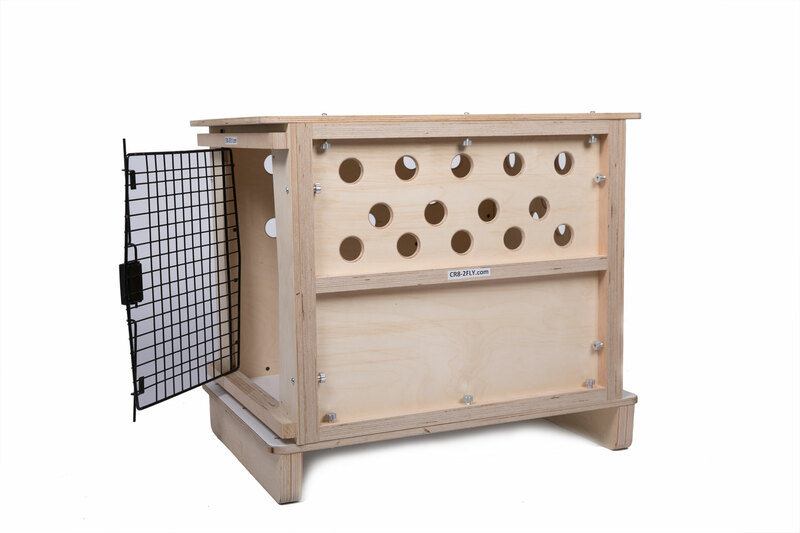 CR8-2FLY® wood crates are proven to be the safest most convenient option for airline traveling pets! This exceptional Ready to Assemble dog crate is made with 100% Plywood and is safe, sturdy, virtually indestructible and still Fully Portable! The Door is made of 100% Stainless Steel with spring loaded latching system as required by most Airlines and zip ties can be used for extra security. Assembles and breaks down in minutes: This heavy-duty all-wood crate conveniently breaks down in minutes to less than six inches in height for easy transportation. International and Domestic Compliant: Made with 100% Plywood to simplify import inspection. Durable: Will last many uses. The floor is laminated to protect against damage caused by urine. Easy & Convenient: This crate can be set up or taken down in seconds by hand (no tools) for easy transport and storage. 4-Sided ventilation: Superior flow-through ventilation on all four sides keeps your dog comfortable and safe and the taller height allows more headroom for your pet. Our crate is 100% dog friendly with absolutely no harmful toxins, chemicals, or dyes in any of the materials. Safe and Secure:Double reinforced wood panels to comply with IATA and airline requirements for traveling dog breeds deemed aggressive. More great features: Airline rails, IATA (Air Transport) compliant. Built In Pallet Feet: allowing airline to add wheeled fork lift to move the crate and dog with ease.